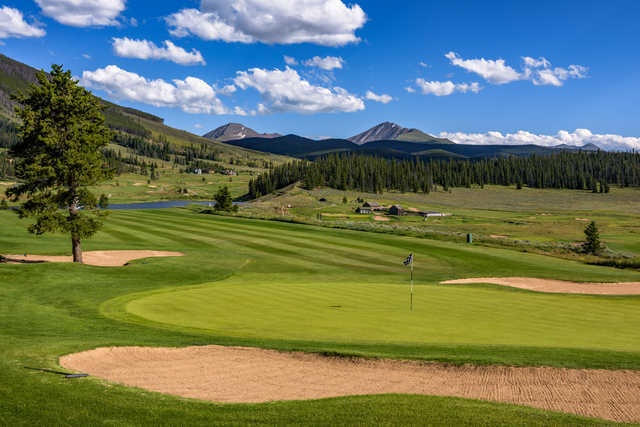 The 18-hole Keystone Ranch Golf Course in Keystone, CO is a resort golf course that opened in 1980. 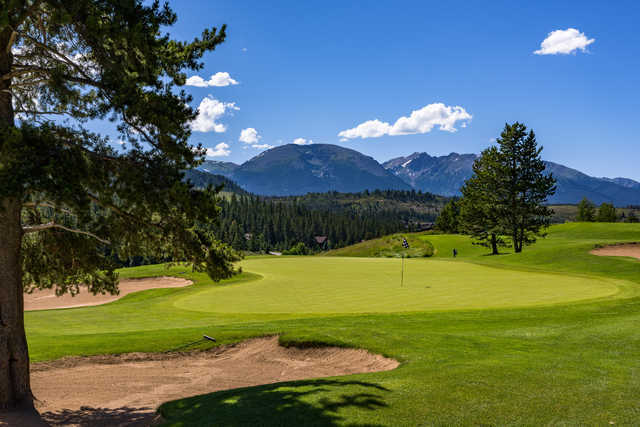 Designed by Robert Trent Jones, Jr., Keystone Ranch Golf Course measures 7090 yards from the longest tees and has a slope rating of 141 and a 72.3 USGA rating. The course features 4 sets of tees for different skill levels. The greens are blue grass. Built in 1980 Keystone Ranch is the older of the two Keystone 18 hole courses. 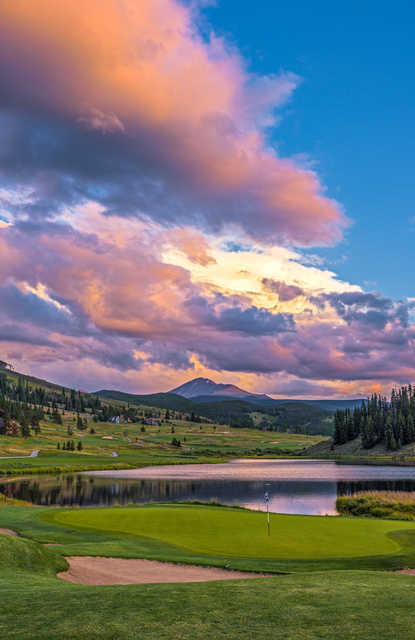 It's a perfect compliment to The River Course at Keystone. Part of your challenge in playing The Keystone Ranch is finding it! From I-70 follow Highway 6 through Dillon past The River Course at Keystone. Take a right on West Keystone Rd. Follow the signs to the Ranch Course across the Snake River. Take a right on Soda Ridge Rd then a left on Keystone Ranch Rd just before the Keystone Stables. Follow this up a steep slope past some great River Course back nine holes then down through the Ranch Course entrance. You'll see the quaint old log Ranch House (this is a super restaurant and the Ranch Pro Shop). Keystone Ranch offers 4 tee boxes (blue, white, gold and red) to fit your game. The Keystone Ranch Course opens with a tree lined par 5 and par 4 similar to The River Course. But the remaining 16 holes are a beautiful mix of Scottish links and mountain meadow holes. #3 is a blind dogleg right par 4 protected by an old Lodgepole Pine sitting in the front, right sand trap. An exciting shot from an elevated tee on #4 drops you to the meadow for the remainder of the front nine. #5 plays 190 yds from the tips (blue tees) and provides a glimpse of Keystone Ranch's history with the weathered old barns and ranch equipment backing this shallow green. #9 is an exciting par 4 with a heavy dose of risk/reward opportunities for those daring to carry a large pond and a marshland inlet from an elevated tee. The front nine has 29 bunkers while the back has a staggering 41. #10 throws you into these challenges. It's a long par 4 and the number 1 handicap hole. You'll learn that most balls break away from Westridge (on your east) toward the west and down the valley toward Buffalo Mountain and the Gore Range.....regardless of what you think you read. #18 is a classic finishing par 5 with a required carry over water and marshland off the tee to a fairway skirting the large pond. See marble slab diagram of The Ranch Course or pull up the scorecard and diagram at www.keystoneresort.com . 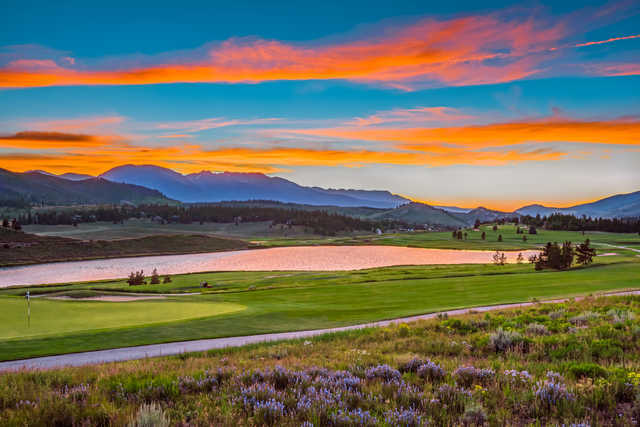 Keystone's Stay and Play is a great deal for the perfect sampling of Rocky Mountain golf, fishing, hiking, biking and dining. And the air is cool, fresh and clean. Check it out. Overpriced relative to other mtn courses. Good layout with interesting holes and great views. Good condition; played in 4 hrs. Very poor range, can only hit irons (nothing over 230 yds). Pro shop and other facilities lacking; minor attitude amongst employees.